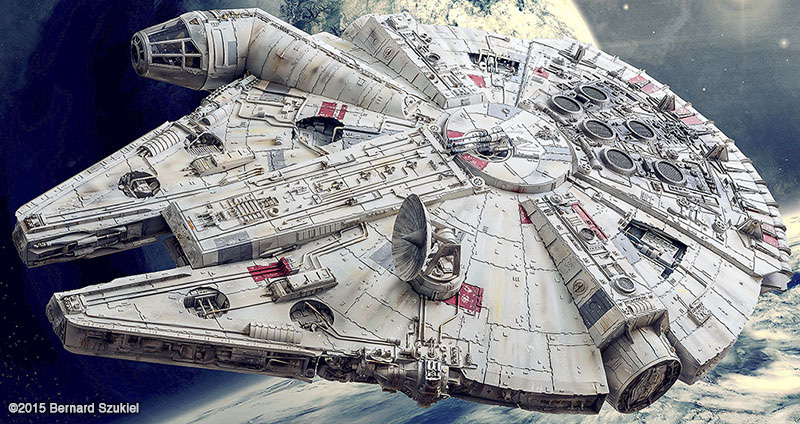 The Millennium Falcon from Star Wars is one of the most recognizable sci-fi space ships ever, and that's led to some pretty awesome fan art of all kinds. About the coolest we've seen so far comes from Bernard Szukiel and his flat-out amazing model made almost completely from paper. His 38-inch model is so detailed it looks as if it flew straight out of the movie. Bernard spent four years on the project where he paid attenting to even the smallest details, like properly lit control panels in the cockpit and gun turrets. His model looks so good it's hard to believe it's made from paper. We clearly need to step up our papercraft skills.